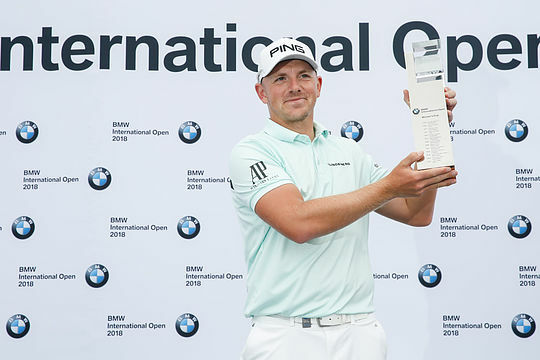 England’s Matt Wallace won his second European Tour event of the year with victory at the BMW International Open in Germany on Sunday. Wallace, 28, fired a bogey-free 65 and finished on 10-under-par to beat Denmark’s Thorbjorn Olesen by a shot after Olesen earlier held the clubhouse lead after closing with a 11-under-par 61. Olesen’s round was the lowest in the tournament’s history and the joint-lowest of the season. Olesen finished in a share of second position along with Martin Kaymer and Mikko Korhonen. Sunday’s victory was the third European Tour win of Wallace’s career with the world number 91 also winning the Hero Indian Open in March and the Open de Portugal in May 2017. Wallace has climbed more than 1,600 places in the world rankings since September 2015, and continues to go from strength to strength. The victory comes off Wallace’s previous achievements where he’s won six times on the lowly Alps Tour to gain a foothold on the Challenge Tour before graduating to the full European Tour with victory in Portugal in May 2017. On Saturday Martin Kaymer, Aaron Rai, Lucas Bjerregaard, Australian Scott Hend, Max Kieffer and Chris Paisley all had a chance to win this title finishing the third round tied for the lead on 5-under par. Wallace was two off the pace at the start of the final round yet made ground quickly on the back nine with five birdies in seven holes, and no bogeys, before carding a 65 which was enough to record his second European Tour victory this season. “Brilliant to win here in Germany,” said Wallace after his round. He moves from 25th to 11th in the Race to Dubai Rankings. It was also the fifth European Tour win for a player from England this season following Chris Paisley at the BMW SA Open, Tommy Fleetwood at the Abu Dhabi HSBC Championship, Eddie Pepperell at the Commercial Bank Qatar Masters and Wallace’s win in India. Scott Hend topped the Aussie field despite a final round 70 seeing him fall back into a share of 7th position at 7-under-par. Of the other Australians, Wade Ormsby finished at 4-under for a share of 16th position, with Nick Cullen at 1-over and equal 45th place. Adam Bland, Marcus Fraser, Lucas Herbert, Jason Norris, Sam Brazel and Jordan Zunic missed the weekend.